The Associate Artistic Director of Company One Theatre and the director of Wig Out! (at OBERON April 26 - May 13, 2018), Summer L. Williams reflects here on the show’s creative process and the role of cultural spaces in celebrating and sustaining intersectional identities. As a theater director, what is it like to be staging a drag show? Well, I want to clarify that this play is representative of ball culture. Today people go to drag brunch on Sundays and watch drag shows on television, but the world of the balls is something else entirely. “Drag” can imply a kind of packaged entertainment, but balls are events that allow for—that celebrate!—the deep complexities and variations of identity and experience. Performers compete for different “houses” in categories ranging from “face” to “realness,” but there’s also great love and support. To walk a ball category is to, in many ways, fully live one’s truth. The ball scene is very much alive and well, but still quite underground. It hasn’t taken off in the way that drag pop culture has. I was lucky enough to go to a ball here in Boston, and it’s a very tight-knit community. And it’s a lot of work. The stakes are really high: your name and reputation are on the line; there’s money on the line—and all those things matter. 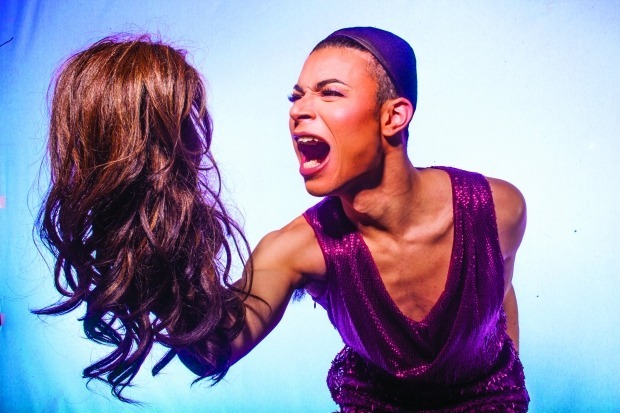 Speaking of the distinction between ball culture and drag pop culture, this play highlights identities beyond conventional understandings of labels like “gay” and “trans,” “masculine” and “feminine.” How has that complexity been active in your work on this play? This is a story about love beyond gender identity, beyond sexual identity. And it’s a story of how those identities can be at odds with one another. The world has said we need to define ourselves by those identities, but this play is asking the world, “What happens if I choose not to categorize myself by those standards?” In that case, the world will have a tough time figuring out who I am, in which case I can be seen as somehow less acceptable. And if I am made somehow less acceptable to the world, that invites you to strip away my humanity. One of the things we’re talking about in the rehearsal room is the phrase “masc 4 masc” [as in “masculine for masculine”—seen frequently on male dating sites]. For queer male identity, that language is very coded. It doesn’t have anything to do with notions of gender—it has everything to do with notions of status and power. And that’s an instance where status and power are becoming entangled in the way that we love and connect. Would you say that a source of tragedy in this play is the ability of prejudices from the outside world to filter into the alternative spaces made by queer communities, especially queer communities of color? Absolutely. But the flip side of that coin is that ball culture emerged as an answer to white-dominated queer spaces, so we can’t have one without the other. That’s also an important part of queer history: we also have to look through the lens of race, which forged really interesting pathways forward that wouldn’t have existed in queer culture otherwise. In his Author’s Note for the script, McCraney notes that queer culture has been readily absorbed by pop culture, but he asks “are they ready for queer life of color?” At this particular cultural moment, what has it been like to work on a play centering queer young black and brown people? Stories that center all kinds of black and brown people are my jam and will always be my jam. So on the one hand, it feels like being home. On the other hand, I know what it feels like as a black woman in Boston to go into a restaurant or new bar somewhere downtown and be one of very few brown faces among the clientele. Now I have a deeper understanding for what it might mean to also want to go into that space and be black or brown and queer, and feel like there’s not a place for me in the area of the city that I call home. In that way, your work intersects with some of the conversations about race that have long been overdue in Boston. As someone who has made an artistic home here, what does it mean for you to be doing this play here now? I can proudly say that as a director and as a co-founder of Company One Theatre, if we were to go away tomorrow, I would know that we have pushed down some walls. We have made space for people to have their stories told as authentically as we can tell them, and it feels like we are continuing to do that work. It’s significant, but it’s not significant. It’s a little unfortunate and embarrassing that it is “so significant.” That’s the part that’s really difficult. You have to marvel: “It’s 2018, and there’s still a need for this change and growth.” I’ve been thinking a lot recently about Beyoncé’s performance at Coachella, where she was the first black woman to headline the festival. You have to walk into the space with confidence, holding up the torch, shining the way forward. But my God, it can’t be comfortable that this is the first time. Chosen homes are a central theme in this play—spaces which celebrate the complexities misunderstood, excluded, or criminalized by the outside world. Has the idea of a chosen home been active in your rehearsal room, or your thinking about potential audiences for this piece? Absolutely. One of the things that excites me is that this show features a company of up-and-coming performers. Company One prides itself on being a stepping stone toward career opportunities that performers may not have gotten before working with us. In our current season, we made a conscious effort to produce three plays by black male-identified playwrights centering voices of black and brown men. That centering is really about celebrating the fullness and the richness of all that those lives are, in order to counter the narrative that we see over and over again in the media that those lives don’t matter. Two black men were recently arrested for sitting in a Starbucks, arrested just for sitting and waiting. That’s a disgusting and disturbing story, but it’s not surprising. The story of this play has been deeply personal for many members of the company, and audiences will be the “twelfth cast member.” The goal is for people to feel deeply and intimately a part of something, for us to live in the unique world of the play together. I want people to move, and feel like they can get out of their seat and dance if they want to. I want people to talk back to us. I want people to feel like this is a full world. Because in all of this, I think there’s a real celebration of joy for what is. That’s the purpose of the house. That reminds me of the point in the play where one of the characters, Ms. Nina, says that she isn’t wearing make-up to hide anything. She’s wearing it to... what does she say? “To enhance the good!” On this project, I’ve been thinking a lot about how we can make space for ourselves where no matter what the circumstances are, good, bad, or ill, we’re going to make joy. And joy will be had. Interview by Robert Duffley, A.R.T. Editor and Assistant Dramaturg. This article was originally published in the A.R.T. Guide.